Welcome to brethren coming to Indianapolis from out of town. Wish we could do something about the rain. And the FFA convention. The Board is meeting Friday night, so we're unfortunately out of the socializing loop for the evening. In addition, the competition for dinner tables will be tough downtown, as there are 55,000 Future Farmers of America in town for the week. I have made a reservation for 12 people at a very uniquely Indianapolis restaurant, the Rathskeller, at 7PM, in case you are interested. 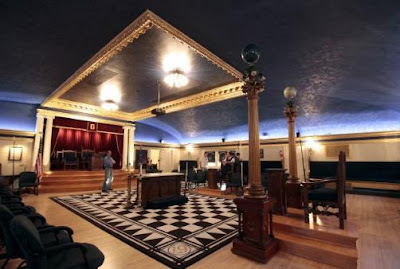 It is in the name of The Masonic Society, and it is upstairs in the "Director's Room." Jeff Kaplan is heading up the group and will meet there at 7. It is a German restaurant, but with a very wide menu, a huge beer list as you can imagine, in a wonderful old building, and located at 401 E. Michigan St. (3 minutes by car, or about a 12 minute walk from the Hilton Garden Hotel.) There is room for more than 12, if you are so inclined. If the Board finishes early, I'll come up and at least have a largish beverage. Here are a few other options within walking distance of the Hilton Garden Hotel. "Explore the fact in the fiction surrounding some of Washington, DC's most famous symbols, images, and legends." So reads the description of the Discovery Channel's new program, "Hunting The Lost Symbol," this coming Sunday night, October 25th at 8PM, and again at 11PM (EST). The 2-hour show features Mark Tabbert, Brent Morris, Dr. Bob Hieronimus, Mark Koltko-Rivera, me, and Alice Von Kannon (my wife and co-author of Conspiracy Theories & Secret Societies For Dummies, and The Templar Code For Dummies), and many more. I pass along my usual disclaimer: I have not seen the program, a script, or even a rough edit, so I will be as surprised as the rest of you on the 25th. 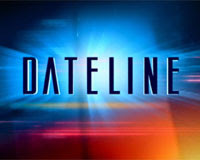 The program repeats November 1st at 4PM. And then, undoubtedly, ad infinitum. I am quoted in code. Specifically, a number substitution cryptogram. 04.22.19.19.21.11.13.05.20.22.09 15.19.11.06.12.19.13 24.19.13.13.05.20.13 05.04 13.05.06.08.11.24 11.20.18 21.05.22.11.24 23.08.22.15.16.19.13 26.11.13.19.18 05.20 13.09.21.26.05.24.08.13.21 05.04 15.12.19 15.05.05.24.13 11.20.18 24.11.20.14.16.11.14.19 05.04 15.12.19 11.20.06.08.19.20.15 26.16.08.24.18.08.20.14 15.22.11.18.19, 16.13.08.20.14 15.12.19 26.16.08.24.18.08.20.14 05.04 11 13.15.22.16.06.15.16.22.19 11.13 11 13.09.21.26.05.24 04.05.22 15.12.19 26.16.08.24.18.08.20.14 05.04 06.12.11.22.11.06.15.19.22 08.20 21.19.20. 21.11.13.05.20.13 11.22.19 05.26.24.08.14.19.18 15.05 17.22.11.06.15.08.06.19 26.22.05.15.12.19.22.24.09 24.05.23.19, 21.16.15.16.11.24 11.13.13.08.13.15.11.20.06.19, 19.07.16.11.24.08.15.09, 13.19.06.22.19.06.09, 11.20.18 15.22.16.13.15 26.19.15.25.19.19.20 19.11.06.12 05.15.12.19.22. This is from the upcoming book, Cracking Codes and Cryptograms For Dummies, by Denise Sutherland and Brother Mark Koltko-Rivera. With over 300 different puzzles of varying skill levels from the simplest substitution puzzles to fiendishly difficult ciphers Cracking Codes & Cryptograms For Dummies provides an introduction to the use and function of codes and cryptograms in the world of secret societies and their connections to conspiracy theories. The book is unique in that there are three conspiracy stories, set in the times of the American Revolutionary War, American Civil War, and the present day, which are encrypted through the book - to uncover the stories you need to crack the ciphers! Cryptograms with letter substitutions, number substitutions (A=1, B=2, etc. ), and symbol substitutions (A=♦, B=☼, etc.). Masonic Ciphers—a collection of real symbols and ciphers used by Masons for hundreds of years, including the substitution cipher exchanging letters for symbols based on a grid design (also known as the Pigpen Cipher). Caesar Box Ciphers—messages are written down the columns of a grid, and transcribed by row by row. Keyboard Ciphers—using cellphones and computer keyboards to create ciphers. Twisted Path Ciphers—the message is written into a grid, along a winding path, and then transcribed row by row. Anagrams—rearranging the letters of a word or phrase to produce a new word or phrase. Double level Ciphers—by solving one cryptogram you get a keyword, which then allows you to crack the encryption on a different kind of puzzle. I was honored to be asked to write the foreword, but Denise and Mark have done a fantastic job creating a very fun book that will drive you crazy. Due in stores any day now. "A pipe is the fountain of contemplation, the source of pleasure, the companion of the wise; and the man who smokes, thinks like a philosopher and acts like a Samaritan." For those of you who have long admired the art of the pipe, but didn't know where to start when it comes to partaking of the joys of the leaf and briar, The Art of Manliness website features a Pipe Smoking Primer, written by Jason Mills. The 1979 Surgeon General's Report on Smoking and Health (Table 7, Section 13, page 17, or page 637 in pdf form) shows that, in one study (H. A. Kahn), pipe smokers of 1-4 bowls a day actually have a lower mortality rate than non-smokers. Table 8 of a second study (E.C. Hammond), shows pipe smokers who smoke more than 9 bowls a day, again, had a lower mortality rate than non-smokers. That's because a pipe keeps us calm and free from hysterics. Brethren in Salt Lake City were discussed in a lengthy article in Friday's Salt Lake Tribune. Have a look here. Also, Brother Mark Koltko-Rivera, himself a Mormon, discusses Brown's few references to Mormonism in The Lost Symbol in a separate article, Mormons off the hook in Brown's book. However, one of Brown's major themes -- that human beings have the potential to be gods -- echoes Mormon teachings. "That should resonate with Latter-day Saints," says Mark Koltko-Rivera of New York City, a Mormon high priest and Master Mason. "I know this is our doctrine that causes the most trouble with other Christian churches. But it is a central belief that we should be more open about and celebrate." It would have made fictional sense for Brown, who visited several Utah LDS and Masonic sites in 2006, to create a Mormon character as his anti-Masonic foil. After all, antagonism between the two groups goes back a long way and often was contentious, even violent. In the 1840s, many LDS leaders, including church founder Joseph Smith and apostles Brigham Young and Heber C. Kimball, became Masons and organized a Nauvoo Lodge under the auspices of the Grand Lodge of Illinois. It wasn't long before nearly every male Mormon in the area had joined. 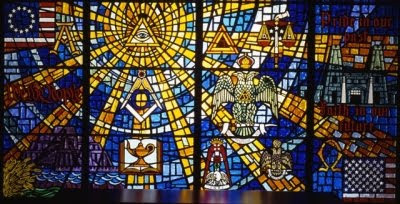 At the same time, Smith introduced LDS temple rituals that included secret handshakes, signs and symbols like the all-seeing eye, the compass and square (tools of the mason's trade) along with the sun, moon and stars that paralleled Masonry. Soon, other Masons felt that the Mormons were dominating the fraternity. The Nauvoo Lodge was suspended in 1842. Many Mormons believed that Masons contributed to the murder of their prophet June 27, 1844. Smith reportedly began to utter the Masonic distress call, "O Lord, my God, is there no help for the widow's son?" as he fell to his death from a second-story window after being shot by a mob. In 1859, a Masonic lodge was established by Johnston's Army at Utah's Camp Floyd, but it didn't accept Mormon candidates. At the same time, Young forbade Mormons from joining and refused to allow any Mason to hold priesthood leadership positions in the church. It wasn't until 1984 that LDS President Spencer W. Kimball removed the prohibition against Latter-day Saints becoming Freemasons. Later that year, the Grand Lodge of Utah discontinued its own ban on Mormon membership so that, in the ensuing years, many LDS men have returned to this part of their heritage. In 2006, Glen Cook became the first Mormon to serve as the state's Grand Master. Some people suggest that Smith copied Masonic rituals for his LDS temple, but Koltko-Rivera thinks that's too simplistic. Instead, he says, it was just the trigger for Smith's divine inquiries. "Masonry prepared Smith for a vision of the Latter-day Saint endowment," Koltko-Rivera says. "The two ceremonies are complementary. Both are fascinating but in very, very different ways." The Masonic Service Association's Richard Fletcher on Discovery News today. 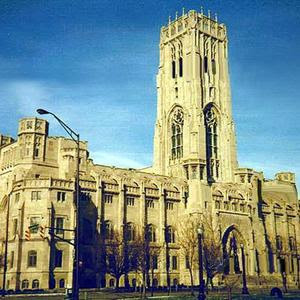 Plus, tours of the 100-year-old Indiana Freemasons’ Hall and the Indianapolis Scottish Rite Cathedral, the largest of its kind in the world. Event Registration: $65, includes luncheon and banquet. Both members of the Society and non-members are welcome to register and attend. Be sure to invite the brethren of your lodge! Your Lady or Other Guest may attend the conference and banquet for an additional $65 per person. To make reservations, see the official Semi-Annual meeting webpage. Please make reservations by October 17th! Do it right now, while you're thinking about it! Not a member of the Masonic Society yet? To join online, visit our website here. Tomorrow evening, Friday October 16th, Dateline: NBC will air "Secrets of The Lost Symbol," with an exclusive interview of Dan Brown, shot in the Supreme Council Room of The House of the Temple in Washington DC. I understand Brent Morris and Art DeHoyos were also interviewed for the show (I had a long, fun conversation with the producer the day Brown's book was released, as we both read it simultaneously. If ever there was a time to be a Freemason living in Washington, this last month was it). The show airs at 9PM EST. "Explore the fact in the fiction surrounding some of Washington, DC's most famous symbols, images, and legends." That's the description of the Discovery Channel's new program, "Hunting The Lost Symbol," which was to premiere this coming Saturday, but has been bumped back to Sunday, October 25th at 8PM and again at 11PM (EST). The 2-hour show features all of your favorite regulars, Mark Tabbert, Brent Morris, Dr. Bob Hieronimus, Koltko-Rivera, me, and Alice VonKannon (my wife and co-author of Conspiracy Theories & Secret Societies For Dummies, and The Templar Code For Dummies). Plus many more. I have been in the film business for a long time, so I will simply pass along my usual disclaimer: I have not seen the program, a script, or even a rough edit, so I will be as surprised as the rest of you on the 25th. 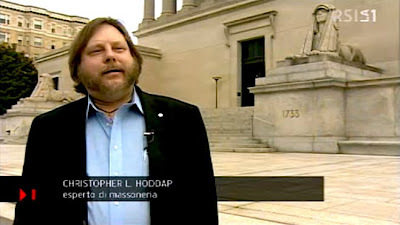 While visiting Annapolis last week, I was contacted to be interviewed by the Italian language Swiss TV network (they also have French and German language stations as part of their group). It just happened that it was while the Supreme Council of the Scottish Rite, Southern Jurisdiction was in session. Yes, I know, it's in Italian. Yes, I know, they misspelled my name. I was standing on the steps of the House of the Temple with the Swiss TV crew. 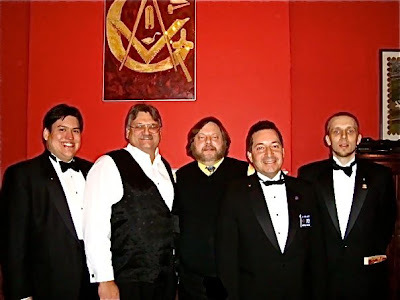 As we stood there, several Masonic brothers, literally from all over the world, poured out of the door, and we all greeted each other warmly as they headed for their cars to go to meetings. Meanwhile, Masons visiting from out of town wandered up to take pictures and tour the building. One came over to have me sign his book and say what a profound effect Masonry had on his life. Just to make sure we all got the message, he went around the block and did it again. My belated thanks to the brethren of Annapolis Lodge No. 89 in the beautiful town of Annapolis, Maryland, for their warm welcome and incredible hospitality earlier this month. I had a fantastic time and cannot praise the brethren of this lodge enough. WBro. Bruce Lanier and his officers have much to be proud of. It was a great opportunity to be invited to speak to this lodge, and I thank everyone who came out. Thanks also for the opportunity to spend a little time at the Annapolitan Club. It was a fun way to cap off the evening. Brother Harrod arranged for accommodations at the wonderful Governor Calvert Inn. My only regret was that I didn't bring Alice and several more days of leisure time with me. Annapolis is a unique place. We'll be back. The United States Holocaust Museum has a detailed article on its website about the treatment of Freemasons under the Nazi regime. When the Nazis came to power, policy towards the Freemasons was equivocal. Efforts to eliminate the Freemason did not receive top priority. Those lodges that espoused tolerance and equality and had international connections or connections through their leaders to the Social Democrats or liberal democrats were subject to persecution and often pressured into “voluntary” dissolution. A few conservative German lodges that were willing to accommodate themselves to the regime were able to continue some form of existence for only a little longer. 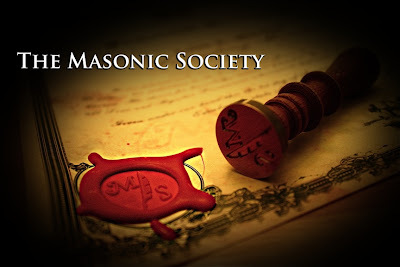 Nevertheless, the regime intended to exclude those who refused to give up their Masonic connections. In early 1934, the chief of the Nazi Party Court System ruled that Masons who did not leave their lodges prior to January 30, 1933, could not join the Nazi party. That same month, Prussian Minister of the Interior Hermann Goering issued a decree calling upon the lodges to “voluntarily” dissolve, but requiring such voluntary actions to be submitted to him for approval. In addition, lodges and their branches in various cities throughout Germany were exposed to arbitrary violence from local SS and SA units, though this terror does not appear to have been centrally directed. Increasing pressure in the public and professional sectors forced individuals to choose between remaining in their lodges or limiting their career opportunities. Many former lodge members holding positions in the civil service were forced or harassed into retirement. In May 1934, the Ministry of Defense banned membership in lodges to all personnel -- soldiers and civilian employees. During the summer of 1934, after Heinrich Himmler and Reinhard Heydrich completed their takeover and centralization of the Gestapo, the German police forcibly closed down many Masonic lodges and branch headquarters of the Masons and confiscated their assets, including their libraries and archives. On October 28, 1934, Reich Minister of the Interior Wilhelm Frick issued a decree defining the lodges as “hostile to the state” and hence subject to having their assets confiscated. Finally, on August 17, 1935, citing the authority of the Reichstag Fire Decree, Frick ordered all remaining lodges and branches dissolved and their assets confiscated. The Lost Symbol prominently features a small, portable sculpture of a pyramid as a plot device, which Dan Brown repeatedly refers to as a "Masonic pyramid." 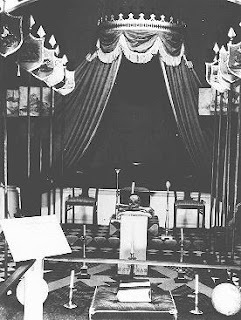 So, just about the time I sat down to write that Freemasons generally don't have pyramids in their lodges and their symbolism, I run across Lafite's Photostream collection taken inside of the Grand Orient of France's Paris temple (that sadly suffered major fire damage last week). These shots were taken more than two years ago, and it's a shame to know these lodge rooms have been seriously damaged. But lo! and behold, there sits a pyramid on what I presume to be the treasurer's desk (No, Mssr. Lafite would not grant me permission to post the photo here). The Grand Orient is not recognized as regular by the majority of Masonic jurisdictions in the world, but if there is a GO Mason out there who could explain the significance of this pyramid sculpture in their lodge room, I'd love to hear it. It is possible it's nothing more than an elaborate alms box. 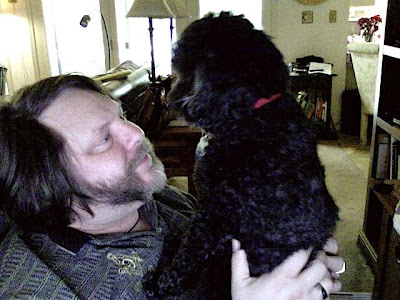 These writing projects are NOT going to get done if this poodle is going to insist on sitting here. The Knights Templar of Levant Preceptory donned our chainmaille and helmets ten days ago for a documentary crew from Halifax, Nova Scotia. 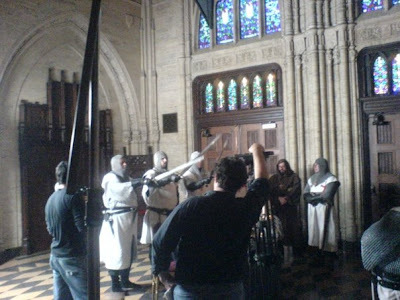 We performed our public program that depicts the Friday, October 13th arrests of the French Templars in 1307, and were appropriately shot in the Tyler's Room of the very Gothic Scottish Rite Cathedral in Indianapolis. The program, being made for Canadian television, will hopefully air next year on the National Geographic Channel. Helm tip to Brother Stephen Dafoe for putting the producers in touch with us, and to Sir Knight Jim Dillman for his tireless efforts. Four men have been arrested while in the act of burglarizing a Masonic lodge (Pride of Pascagoula Lodge No. 485) in Pascagoula, Mississippi late Thursday afternoon. Witnesses spotted two men kicking in the back door of the building. Police say when they arrived, Shawn Martin, 17, and James Wright, 17, were in the front doorway. Later, police say they found Ladarius Stallworth, 17, and Tykarius Smith, 18, hiding in an upstairs bathroom. All four were taken into custody and charged with burglary. Smith was out on bond, accused in a drive-by shooting. Authorities say he fired a shotgun from a car in an apartment complex on Hospital Road. That shooting happened in May. Three people were hit, including a woman who was taken to the hospital. She was treated and released. Not certain of the affiliation of the lodge. It does not appear to be part of the Grand Lodge of Mississippi F&AM, the M.W. Stringer Grand Lodge of Mississippi F&AM (PHA), or the M.W. Prince Hall Grand Lodge Free & Accepted Ancient York Masons (PHO National Compact). 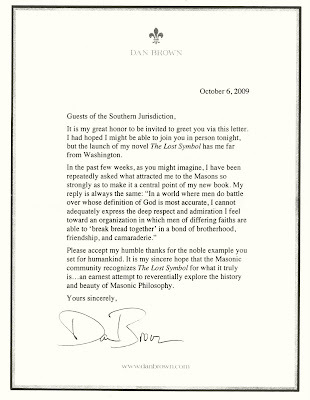 Dan Brown was asked to address the Scottish Rite-SJ's annual gathering in Washington DC this past week, but because of his schedule, could not be there. You might be interested in his letter. (Click the image to enlarge). 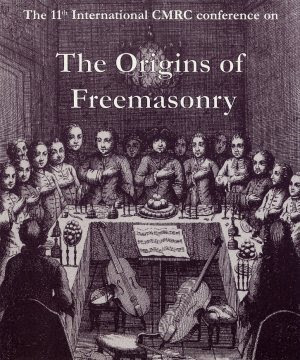 In the past few weeks, as you might imagine, I have been repeatedly asked what attracted me to the Masons so strongly as to make it a central point of my book. My reply is always the same: “In a world where men do battle over whose definition of God is most accurate, I cannot adequately express the deep respect and admiration I feel toward an organization in which men of differing faiths are able to ‘break bread together’ in a bond of brotherhood, friendship, and camaraderie." Please accept my humble thanks for the noble example you set for humankind. It is my sincere hope that the Masonic community recognizes The Lost Symbol for what it truly is…an earnest attempt to reverentially explore the history and beauty of Masonic Philosophy. If there was one phrase I could expunge from the lips of every Mason (and especially, with all due respect, grand masters) it is "We have no secrets, except a few funny handshakes." That is not true, and it does terrible disservice to the fraternity. Yet I keep seeing it in story after story that appears in the press about the fraternity. Somehow we've come to the conclusion that secrecy is a bad thing that makes the public suspicious. It makes reporters suspicious. It makes suspicious people more suspicious. Nevertheless, it is one of our most treasured possessions that makes us different from the Rotary, the Lions and the American Legion. Please, brethren, STOP SAYING WE HAVE NO SECRETS. We have secrets. We have lots of them. And it really is okay to say, "I'm sorry, there are things I just cannot tell you." Masonic secrecy is one of the most misunderstood aspects of the fraternity. 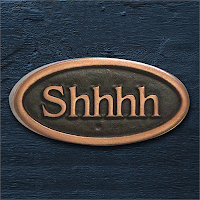 Freemasonry teaches its philosophy to its members through symbolism, and secrecy is actually a symbol of honor. Originally, the medieval stonemason guilds kept the practices and knowledge of their skilled trade as closely guarded secrets, to protect the value of their livelihood, and to ensure only qualified men were employed. Likewise, passwords and secret signs were developed so members of the guild in different parts of the country could recognize each other, even if they had never met. These traditions have been retained by the modern Freemasons. If a person can’t be trusted to keep a simple secret like a password or a handshake, his word isn’t really trustworthy. He is not an honorable person. There are other secrets, besides these modes of recognition. Some have to do with the specifics of Masonic rituals and ceremonies of initiation. Others are more personal, and different for each Freemason. Most of all, like all initiatic experiences in the world, the real secrets of Freemasonry are the effects its teachings and ceremonies have on the individual, and how he applies them to his life. 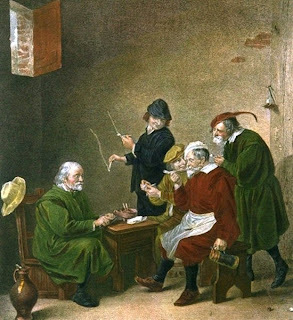 "We know that even the elementary and superficial secrets of the Order must not be communicated to unqualified persons, and the reason for this injunction is not so much because those secrets have any special value, but because that silence is intended to be typical of that which applies to the greater, deeper secrets, some of which, for appropriate reasons, must not be communicated, and some of which indeed are not communicable at all, because they transcend the power of communication." A decent article in yesterday's Minneapolis-St. paul Star Tribune about Minneapolis Lodge No. 19. Check out their website, which is beautifully done, as well. Minneapolis 19 will be moving to the Harrington Mansion (owned by Zuhrah Shrine Temple) on August 27th, 2007. This historic move signifies a major step in our revitalization efforts over the next year or so. We are heading back home to the city where it all began almost 150 years ago. The move back to Minneapolis. Increasing our annual dues and fee structure to realistic levels. Establishing our own perpetual membership fund. Establishing our own 501(c)3 scholarship fund. Purchasing life memberships for our 70+ members. Purchasing life memberships for our new Past Masters. Establishing credit card and bank draft services via the website. Providing a superior website presence for our membership. Our partnership with Zuhrah Shrine is a strategic investment by Minneapolis 19. The third floor ballroom in the Harrington Mansion will be transformed into a first class blue lodge room over the next year. There is hope for those desiring efficiently run stated communications. And there is no reason why most lodges can't accomplish this task in 30 minutes or less. At Minneapolis 19, we only conduct tyled business within a tyled meeting. Everything else is accomplished at our monthly officer meetings. After our meetings, we adjourn to the Harrington Mansion Library for dinner, lodge education and social time. Dinners at Minneapolis 19 are a first class experience. Meals are complimented with your choice of alcoholic or non-alcoholic beverages, the choice is yours at 19. The meals, themselves, are catered by the Zuhrah Shrine banquet facility by renowned resident Chef Michael and served in the Harrington Mansion Library after our Stated Communications around 7 PM. For Special Communications (degree nights), meals will be served before the degree program around 6 PM. There's a brief article in the Edge section of the Boston Herald today about the Scottish Rite Northern Masonic Jurisdiction's National Heritage Museum in Lexington, featuring Jeff Croteau. The Museum has a new exhibit opening this weekend, "Freemasonry Unmasked! : Anti-Masonic Collections in the Van Gorden-Williams Library and Archives." Also on display is "The Grand Lodge of Masons in Massachusetts: Celebrating 275 Years of Brotherhood," featuring more than 150 objects, photographs and documents related to Masonic history in Massachusetts. Washington's House of the Temple, headquarters of the Scottish Rite Southern Jurisdiction, gets all of the press lately, because it has a beautiful, monumental building in D.C., and because of its role in The Lost Symbol. Don't short-sheet the AASR-NMJ (which has similar membership numbers as the Southern Jurisdiction, in spite of being in just 15 states). The museum is outstanding and well worth a visit if you are in the Boston area. 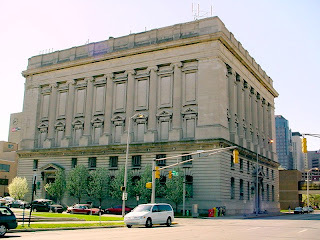 Hotel Accommodations: The Society has arranged for a limited number of rooms at the Hilton Garden Inn Indianapolis Downtown, which is about seven blocks from Indiana Freemasons' Hall. We have negotiated a rate of $109/night for Friday, October 23, 2009 and Saturday, October 24, 2009 (with checkout on Sunday, October 25, 2009). NOTE: If you plan to stay in the hotel, please reserve early as there is a large convention in Downtown Indianapolis the same weekend of our meeting. 9. We cannot guarantee any room availability at this time. There is a link to the hotel on the Semi-Annual Meeting page on our web site. Alternately, you may call the hotel directly at 317-405-5709 and use the group name "The Masonic Society" and group code "TMS". Tickets for the 11th international conference on ‘The Origins of Freemasonry’ are now available priced £99. The conference weekend will begin on Friday 23 October at University College London with an evening showing of a film called The Scottish Key – a recent documentary which examines various theories of masonic origin. This showing is open to conference participants only. The conference itself will take place on Saturday 24 and Sunday 25 October at Canonbury Academy, 6 Canonbury Place, Islington, London N1 2NQ. Dr David Stevenson, Professor Emeritus of Scottish History at the University of St Andrews. Conference tickets cost £99 and cover access to the Friday evening film showing and drinks reception at UCL, entrance to the conference itself, and two lunchtime buffets. Cheques should be made payable to ‘CMRC’ and sent to: The Conference Organiser, Canonbury Masonic Research Centre, Canonbury Tower, Canonbury Place, London N1 2NQ. Please ensure that you enclose your name and full contact details with your payment and also outline any special dietary requirements. Important In view of the postal disruption caused by recent and possibly ongoing industrial action, when sending a cheque can you please send an accompanying email to conference@canonbury.ac.uk to let us know that your payment is in transit. Should you not receive confirmation of your payment within fourteen days of its posting, you should contact us on the aforementioned email or by phone on: +44 (20) 7226 6256. Please note that the CMRC does not accept credit card payment. For any further information please contact conference@canonbury.ac.uk.